Following are the recorded number brackets for Lady Lavery Series replacement notes. 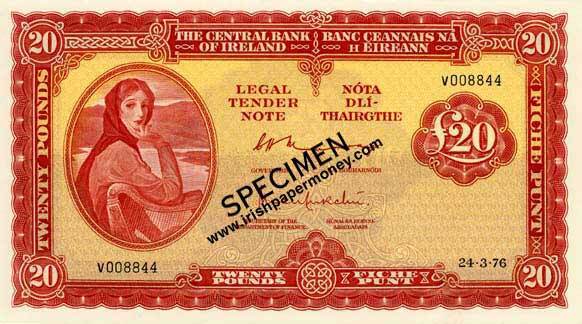 This list will be updated as banknotes expanding the number brackets are recorded. Type 13: (1) T. K. Whitaker. (2) C. H. Murray. Type 14: (1) C. H. Murray. (2) M. O Murchú. Why were there no 10 shilling, 50 pound, or 100 pound replacement notes? There were. Unmarked replacement notes were used - the notes were replaced with notes bearing the same number as the replaced note.